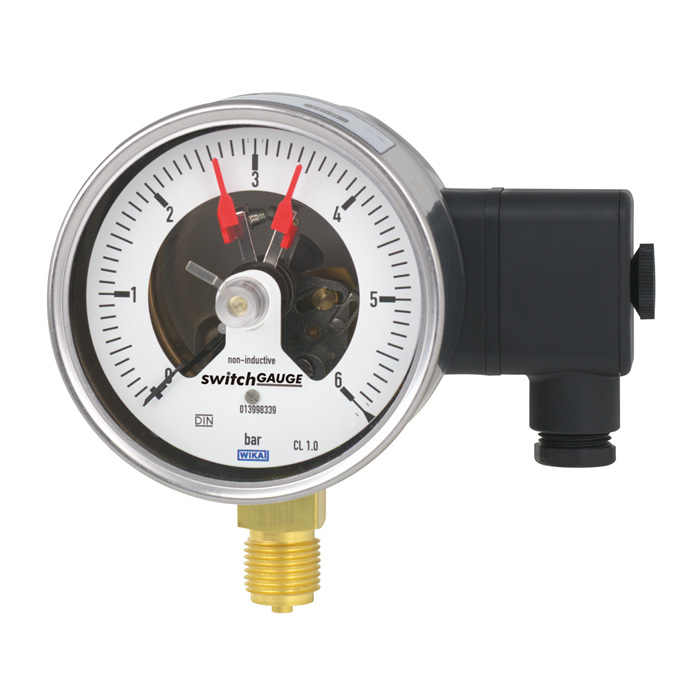 Wherever the process pressure has to be indicated locally and, at the same time, circuits need to be switched, the model PGS21.1x0 switchGAUGE finds its use. Switch contacts (electrical alarm contacts) make or break an electric control circuit dependent upon the position of the instrument pointer. The switch contacts are adjustable over the full extent of the scale range (see DIN 16085), and are mounted predominantly below the dial, though also partly on top of the dial. The instrument pointer (actual value pointer) moves freely across the entire scale range, independent of the setting. The pressure gauge is manufactured in accordance with DIN 16085 and fulfils all requirements of the relevant standards (EN 837-1) and regulations for the on-site display of the working pressure of pressure vessels.